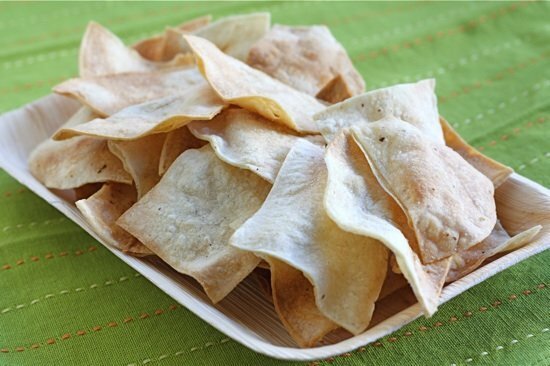 Tortilla chips are easy to make at home and so much better than store bought chips. These crisp and salty corn tortilla chips are baked and not fried, but you will never know. They are SO good! I posted our edamame guacamole recipe this week and mentioned that we made homemade baked tortilla chips to go with our guacamole. Well, I received several emails and comments from readers wanting to know how we made our chips. So today is your lucky day, I am sharing our simple recipe for baked tortilla chips. 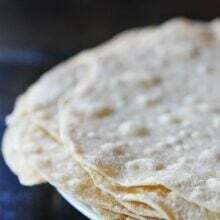 Homemade tortillas are easy to make and we love this recipe because they are baked and not fried. These healthy tortilla chips are just as good as fried chips too! The oven crisps them up and they still have a nice salty kick! You can make tortilla chips from corn tortillas. We purchase corn tortillas from a local Mexican market, they are cheap and fresh. Feel free to use your favorite brand of corn tortillas. Blue corn tortillas are also good and make great chips. We cut the tortillas into triangles. We like a strong, big chip for dipping, so we cut the taco size tortillas into four large triangles. If you want smaller chips, just cut them smaller. No frying is necessary, we lightly brush the chips with oil. You can also spray the chips with oil if that is easier. You do want the chips to be nicely coated so they will crisp up in the oven. Place the chips in an even layer on a large baking sheet and sprinkle with kosher salt. Make sure they are not overlapping. Make sure you watch the chips closely. It doesn’t take them long in the oven and you don’t want them to burn. You can also use the chips to make nachos! Making your own chips at home is easy, fun, and cheaper too. And kids love these easy homemade chips! 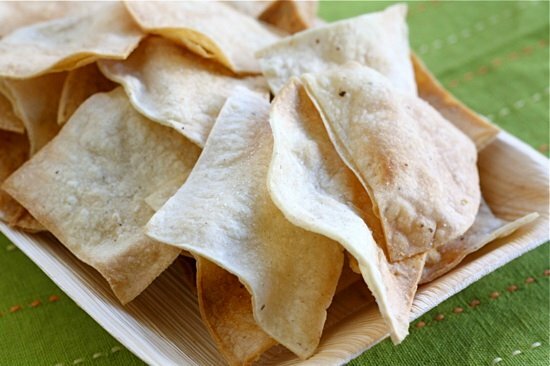 Our boys are always asking if we can make homemade tortilla chips! These chips are made in the oven and are easy to make at home. Preheat the oven to 350 degrees F. Brush the tortillas lightly with oil. Make sure both sides are brushed. Place the tortillas in a stack and cut into triangles with a sharp knife. Place the tortilla triangles on two large baking sheets. Make sure they are in an even layer and aren't overlapping. Sprinkle with salt, to taste. Bake until golden brown and crisp, rotating the baking sheets once, about 10-12 minutes. Cool completely, the chips will crisp up as they cool. Serve with guacamole, salsa, or eat them plain. I love making my own tortilla chips, but I must admit yours turn out much prettier than mine. 🙂 So nicely browned and crispy! Your chips look great. I’ve made baked tortilla chips from brown rice tortillas too, for a lower-glycemic version. They’re on the crispy side, but they work well for thin dips. We do the same thing! and it works out so much bettter. Cheaper, healthier and faster, don’t you think! Great post Maria … they sound so good! We buy a bag of tortilla chips almost every week. I would love to make them healthier! Thanks! We’ll be putting them to good use for sure! I was hoping you would post this recipe. They just look so perfect. What’s the name of the Mexican market? I’d love to stop by. Becky-we go to a couple Mexican markets in Salt Lake City. One is on State Street and about 900 S. It has a yellow sign. The other one is on 900 W and maybe 100 S? Sorry I don’t know the names. They are both really cheap. Check them out sometime. I’ve always wanted to make my own tortilla chips. You’ve just inspired me! yay! I was going to ask you for this recipe! Thanks for posting – they look delicious! Kalyn-I will have to try the brown rice tortillas, sound good to me. I haven’t made my own tortilla chips for a long time and really need to get back to doing so. I have always brushed them with olive oil, but am interested to try the cooking spray. Mmmmm, I’d love this for lunch today with the avocados I will be making guacamole with!! thank you for reminding me of homemade tortilla chips. i have made them a couple times and they are so amazingly simple & yummy. i think i need to make them with dinner tonight. I always love to find ways to make processed food at home! These look delicious and way better for you than store-bought! That sounds easy enough! I can’t wait to try these. Beautiful photo! 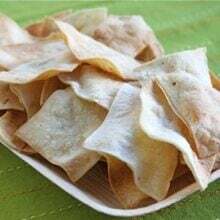 I love making my own tortilla chips especially when I make the tortillas as well. Your tortilla chips look fantastic. I will for sure make these as I loved the baked and not fried! Thanks. Those look great! 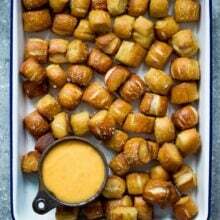 We always throw ours in the deep fryer, but I’m going to make some of these tonight to go with our burritos. They’ll be much better for us! We make these all the time. They are so much tastier than store bought and MUCH healthier. These seem so easy to make and I love it how you baked them not fired them. Oh wow, that’s way easier than I thought it would be. I might have to give it a try! These look so good Maria! I love tortilla chips and it’s been ages since I made my own at home. tastier and fresher! Love these. 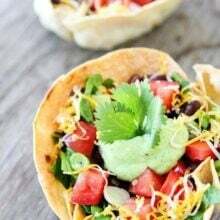 I made some of these for a Mexican dinner a few weeks ago and people went crazy over them! I brushed them with olive oil that was sprinkled with a little bit of smoked paprika and lots of salt. I was just cleaning out my freezer and found some corn tortillas. Time to make some! So simple! Beats some store-bought brands that are loaded with artificial flavors. I’ll have to make these the next time I whip up a batch of salsa or guacamole. homemade tortilla chips rock!!! I always tend to over bake mine though, they sure do crisp within the blink of an eye! yours are PERFECT! These are awesome, so easy! Yum! I’ve done this before but it’s been a long time, thanks for the reminder! Also, I wanted to let you know that I had to remove your blog from my blog roll :(:( It wouldn’t work, it never pulled up your posts. So I’ve subscribed via email, but my readers won’t be able to see you. This started a while back when you switched to WP. If you know of a solution, let me know! These chips look great… I need to look into where I can buy the tortillas! Or, I need to try to figure out how to make my own again… Although, last time it didn’t turn out so well! Thanks for the recipe. The tortilla chips look delicious. I’m gonna try them out. Just made these and I’m eating them right now! So yummy with homemade guacamole for lunch. =) Thanks for the recipe!! I tried out these homemade baked tortillas. They are way better tasting than the fried tortillas sold in the stores and much healthy too. Are you sure they are supposed to be put under the broiler for 5 minutes on each side?? I did that and they were charcoal before the first 5 minutes were up. I tried the second pan with the oven set to bak (not broil) at 450* and they were overdone after 5 minutes too…The third pan baked at 350* and turned out great. Maybe because I used whole wheat tortillas instead of white corn tortillas? Anyway, my fiance and I love chips and salsa, so this will be a great way to change things up once in a while. Thanks! Your oven must cook faster than ours! Or maybe your oven rack is closer? Just watch the chips closely. They do go fast once they are ready. Sorry about that! We have some corn allergies here so we use flour tortillas spread with butter and baked…so yummy! We don’t use cooking spray either. It might be a little more fatty, but I was thinking you could lightly brush them with some olive oil. Thank you!!! I’ve got a couple tortilla packages in my freezer I need to use. I made these last night for the first time (I’ve always baked them and have never had success!). I love, love, love these!!! As did my kids and husband. Thank you!!!! So glad everyone liked the chips! I just made these…LOVE them. They taste even better then the store bought fried ones. This will be a new staple in my house! These will go perfectly with our dinner for tomorrow night. I’ve been looking for a good tortilla chip recipe (just hate buying chips at the store). Thanks! These turned out great! I never thought to make tortilla chips myself, but I’ll be doing this more often from now on, especially since we can find great tortillas here in Texas. Kinda frustrated– maybe it has something to do with my toddler climbing onto the counter behind my back and knocking my medicine to the floor where I was unable to find it– but I set my timer for 3 minutes and the chips were black. Round 2: Put under broiler for one minute. Flipped. Put under broiler again, set timer for one minute, and noticed long before the timer went off that the chips were about to burn. So my chips were more like 90 seconds total bake time, which put them on the verge of being black. Does it have to be white corn tortillas? No, you can use any variety of corn tortillas. I guess I’m two-and-a-half years late, but just found this today. I’d like to make these for a celebratory lunch we’re having in a few days (50th wedding anniversary): problem: won’t have time the morning of. Can these be made a day or two before or will they just turn limp. If they can be made in advance, how would I store them? We broil them. Watch them very closely! You can also bake at 400 degrees. I almost burnt down my house trying to do this! I followed the directions and turned it on to broil, sprayed/salted chips, and put in for 3 minutes. I took them out, turned them over, sprinkled more salt, and put back in. They weren’t in there for a full 2 more minutes when I smelled smoke. I turned the oven off and engaged in a full on freak out. The fire was big at first, so I let it sit in the oven while it was off and prayed to God nothing exploded. Then I got the courage, opened the oven, pulled the tray out, and ran directly outside where I dumped water on the remainder of the fire. I am sure that I am somehow at fault here for the fire (I usually do stupid things) but if there is ANYone out there that is anything like me (accident-prone) think twice before attempting this! I have a napping 10 month old and my heart is beating 5x normal speed right now. All because I wanted some chips to go with some leftover salsa I have at home. BAD IDEA! I am so sorry! We haven’t had a problem with our broiler. You do have to watch them closely. You can also bake them at 400 degrees. Again, watch them closely! I have NO mexican place near me at all. I wish I knew how to make from scratch. 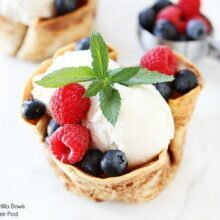 I understand the need to use ‘pretty’ pictures on your site, but this is the second recipe (and I’ve only looked at two, so that’s 100%) that uses a picture that doesn’t accurately reflect the recipe. This one is clearly of square-cut chips, when your recipe says you cut them into triangles. The other recipe is the one for guacamole grilled cheese sandwiches – the recipe says to spread the guacamole onto the bread on top with the cheese, when the photo clearly shows that the bread has been topped with cheese, and guacamole spread onto it. I know I’m a stickler, but as an editor, I feel it’s important to illustrate your recipes accurately, since not all people learn in the same way; for some, the picture is as important as the text. This chips looks so delicious…! Im a tortilla lover.. The Tortilla Chip idea looks great but how long and how hot should the oven be????? Yummy this is my favorite recipe. Thanks.